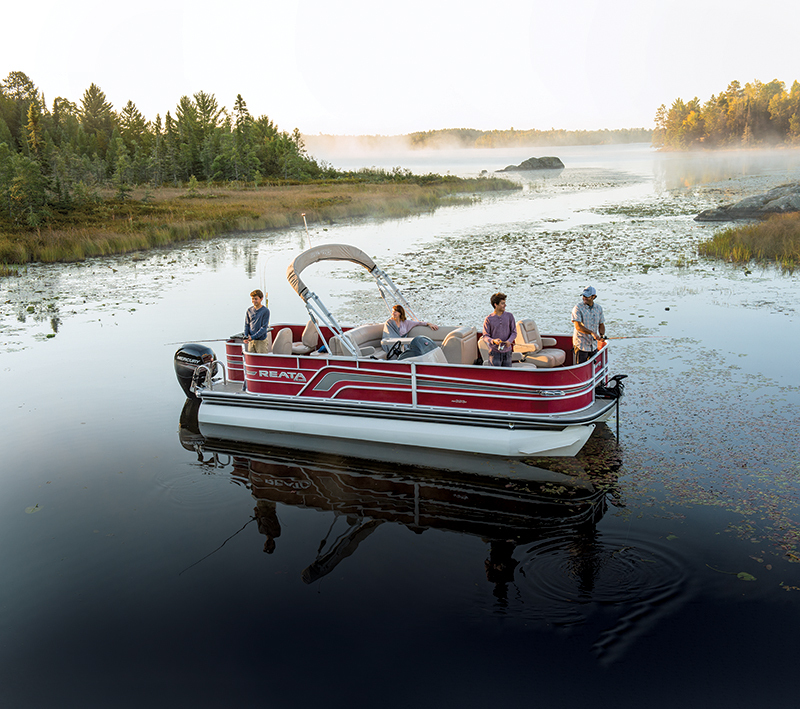 Ranger Boats swings for the fences with its brand new pontoon line. Ranger fishing boats. You have an image in your mind based on those three words, don’t you? Well, 2017 is going to change that image for everyone who knows Ranger. See, the builder now has a pontoon line. Yes, you read that correctly: a pontoon line. Called Reata by Ranger and consisting of seven models — four in the Cruise Series and three in the Fish Series — the new line is sure to change some perceptions about fishing boats. The Reata 223F is the flagship of the Fishing Series at 24 feet, 2 inches long, but it maintains an 8-foot, 6-inch beam, for trailerability. Its triple-tube configuration uses 26-inch-diameter aluminum logs with lifting strakes on both sides of each to deliver performance and lift. And Ranger powder-coats the logs white, to deliver a different-looking pontoon from the bottom up. Inside the fences, it’s an angler’s playground. 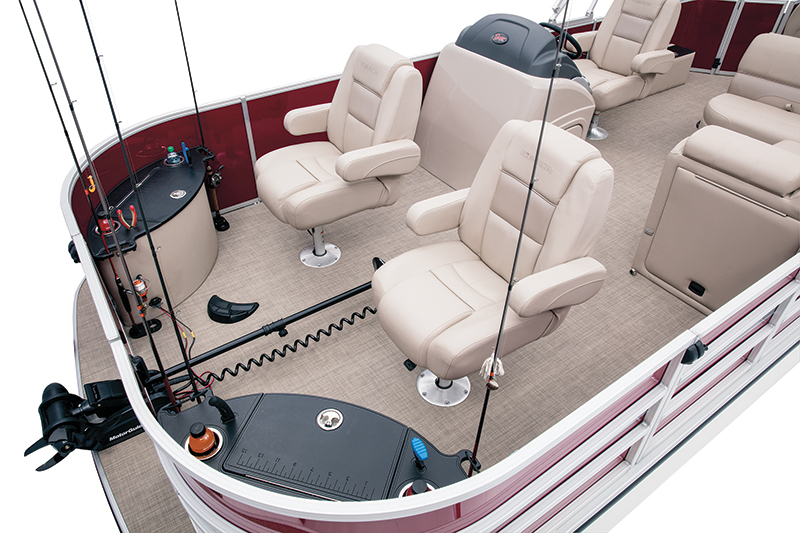 Twin fishing chairs occupy the bow, and each has its own fishing station with built-in rod and cupholders and tool slots. The one to port holds a livewell while the one to starboard is a battery compartment. There are twin fishing chairs aft, too, and those anglers share a fishing station, which includes tool, rod and cupholders, and battery storage. A livewell is under the bench seat just forward of the portside chair. A seven-and-a-half-foot lockable rod box is just aft of the driver’s seat. A curved seat is just port of the helm, and both sections have storage underneath. An extended motor pod holds a Mercury FourStroke outboard and a telescoping ski tow bar, so watersports are in the mix. A trolling motor is attached at the bow.